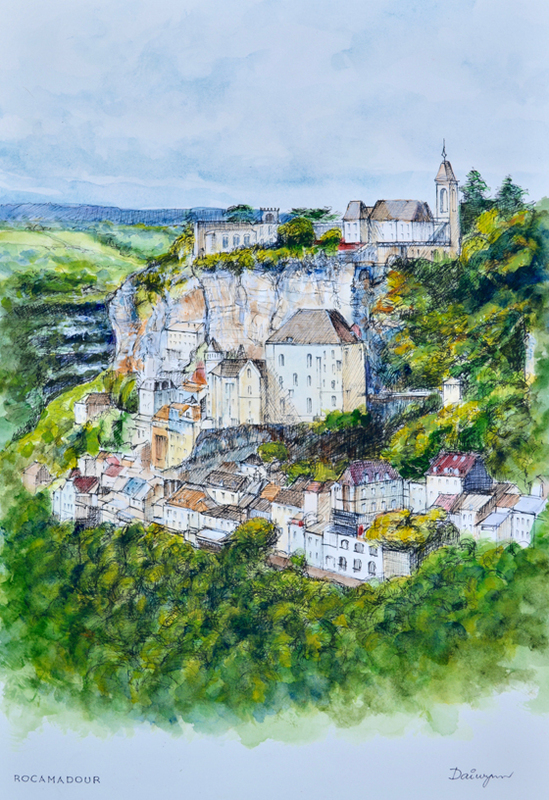 Ink and watercolour painting by Dai Wynn of Rocamadour (la Cité Réligieuse) viewed from the Modern Rocamadour hamlet and car-park. This cliffside/clifftop village is situated in south-central France, is surrounded by verdant forest, and is is known for the Cité Réligieuse complex of religious buildings, accessed via the Grand Escalier staircase. It includes the Chapelle Notre-Dame, with its Black Madonna statue, and the Romanesque-Gothic Basilica of St-Sauveur. Ink and watercolours on 300gsm smooth surface Arches cotton paper. 42 cm high by 29.5 cm wide by 0.1 cm deep approximately.